DAMASCUS: President Bashar Assad rejected US accusations that Syrian or Russian planes struck an aid convoy in Aleppo or that his troops were preventing food from entering the city’s rebel-held eastern neighborhoods, blaming the US for the collapse of a cease-fire many had hoped would bring relief to the war-ravaged country, reports AFP. In an interview with The Associated Press in Damascus, Assad also said deadly US airstrikes on Syrian troops last week were intentional, dismissing American officials’ statements that they were an accident. 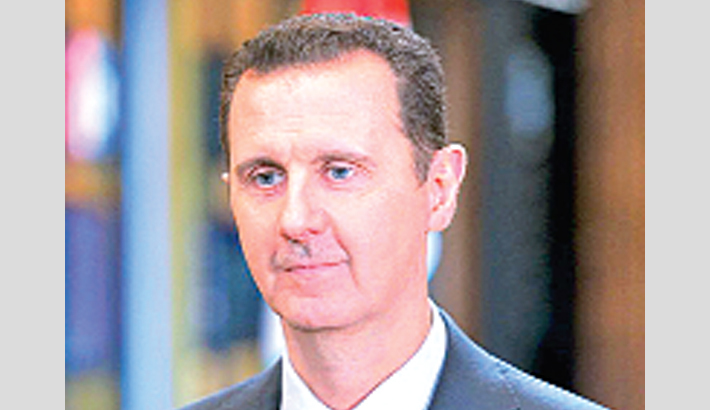 Assad said the U.S. lacked “the will” to join forces with Russia in fighting extremists. Assad, who inherited power from his father and is now in his 16th year in office, cut a confident figure during the interview — a sign of how his rule, which once seemed threatened by the rebellion, has been solidified by his forces’ military advances and by the air campaign of his ally Russia, which turned the tables on the battlefield last year. “When you have many external factors that you don’t control, it’s going to drag on and no one in this world can tell you when” the war will end, he said, insisting Syrians who fled the country could return within a few months if the US, Saudi Arabia, Turkey and Qatar stopped backing insurgents. He spoke Wednesday in Damascus’ Muhajireen palace, a white-stone building where he often receives guests, nestled among trees on the foothills of Qasioun Mountain. The Syrian capital, seat of Assad’s power, has stayed relatively untouched throughout the conflict, spared the devastation inflicted on other, opposition-held areas of the country. In recent months, Assad’s forces have taken rebel strongholds in suburbs of the capital, bolstering security and reducing the threat of mortar shells. The attack on the aid convoy outside Aleppo took place Monday night, hitting a warehouse as aid workers unloaded cargo and triggering huge explosions. Footage filmed by rescuers showed torn flesh being picked from the wreckage. Witnesses described a sustained, two-hour barrage that included barrel bombs — crude, unguided explosives that the Syrian government drops from helicopters. A senior U.S. administration official said the US believes with a very high degree of confidence that a Russian-piloted aircraft carried out the strike. The official wasn’t authorized to speak publicly on the matter and asked for anonymity. Like Syria, Russia has denied carrying out the convoy bombing.